*Allegheny mound, Argentine, black carpenter, cornfield, field, Florida carpenter, harvester, honey, pavement, southern, sugar, nuisance. **NOTE: This product is non-staining to most home siding depending on age and cleanliness. However, before using in areas where the spray may contact home siding (vinyl siding in particular), test in an inconspicuous area and recheck in a few hours. Do not use if any staining is observed. STOP Do not allow children or pets into the treated area until dry. Applications to building foundations, up to a maximum height of 3 ft. Other than applications to building foundations, all outdoor applications to impervious surfaces such as sidewalks, driveways, patios, porches and structural surfaces (such as windows, doors and eaves) are limited to spot and crack-and-crevice applications only. In New York State, this product may not be applied to lawns within 100 ft of a coastal marsh, or stream that drains directly into a coastal marsh. Peel sticker from flip-top cap and open cap. Discard sticker. Remove sprayer from its slot beneath the bottle handle and remove and discard plastic wrap. Pull black hose tip to completely extend tubing. Firmly press black hose tip into opening in cap until it snaps into place. Adjust nozzle to desired setting. To kill ants*, centipedes, cockroaches, crickets, fleas, flies, gnats, millipedes, mosquitoes, pillbugs, scorpions, sowbugs, spiders and deer ticks. Apply as a continuous band of insecticide around building foundation and around windows, doors, eaves, vents and other areas to greatly reduce the potential for entry by crawling pests. For easier application, remove debris and leaf litter from next to the foundation, cut back vegetation and branches that touch the foundation, and move or rake back rocks, deep mulch, or other potential pest harborage next to the foundation. Apply a 3 ft band around the structure and upwards along the foundation to 3 ft and around windows, doors, and roof overhangs. Apply as a coarse spray to thoroughly and uniformly wet the foundation and/or band area so that the insecticide will reach the soil or thatch level where pests may be active. 1 gal will treat 250 sq ft of surface area. OUTDOOR SURFACES USE: To kill ants*, centipedes, cockroaches, crickets, fleas, flies, gnats, millipedes, mosquitoes, pillbugs, scorpions, sowbugs, spiders and deer ticks. 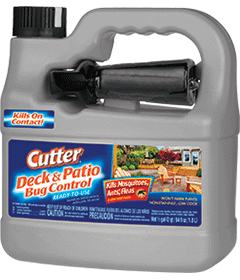 Apply as a residual treatment to ornamental plants next to foundations of buildings and to surfaces of decks, buildings, patios, porches, screens, window frames, eaves, garages and other similar areas where these pests are active. Keeps working for up to 8 weeks on vinyl surfaces. Store in a cool dry area away from heat or open flame. If empty: Nonrefillable container. Do not reuse or refill this container. Place in trash or offer for recycling, if available. CAUTION. Harmful if absorbed through skin. Avoid contact with skin, eyes or clothing. Wash hands thoroughly with soap and water after handling and before eating, drinking, chewing gum, or using tobacco. This product is extremely toxic to fish and other aquatic organisms. To protect the environment, do not allow pesticide to enter or run off into storm drains, drainage ditches, gutters or surface waters. Applying this product in calm weather when rain is not predicted for the next 24 hours will help to ensure that wind or rain does not blow or wash pesticide off the treatment area.